Cook County State's Attorney candidate Kim Foxx speaks at a news conference Wednesday, Dec. 2, 2015, in Chicago, Ill. 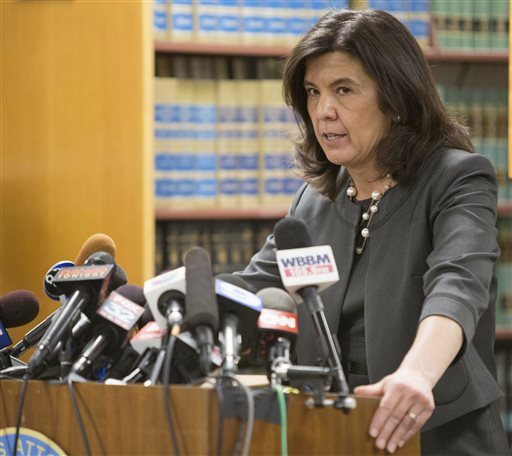 The re-election campaign of Chicago&apos;s top prosecutor took a hit Thursday when the local leaders of her Democratic Party gave their backing to a challenger who has sharply criticized her handling of cases of alleged police misconduct. Alvarez, who is seeking a third term, and Mayor Rahm Emanuel have faced calls to resign since the release in November of police dashcam video showing a white officer shooting a black teenager 16 times. Alvarez&apos;s office charged officer Jason Van Dyke with first-degree murder in the killing of 17-year-old Laquan McDonald, but did so more than a year after it happened and only hours before the city complied with a court order to release the video. Activists, community groups and even fellow Democrats have blasted her office for waiting so long to bring charges, alleging there was a cover-up. Alvarez has been on the defensive, saying such investigations take time. She didn&apos;t show up to Thursday&apos;s candidate slating, saying party leaders haven&apos;t favored her before and weren&apos;t going to pick her. She was scheduled to appear at a news conference later Thursday. The decision came after committeemen said they&apos;d stay neutral in the March primary. Some directly attributed the pivot to the growing discord over the McDonald case, but others have alleged political motivations. Candidates who get such party endorsements in strongly Democratic Cook County can get more campaign donations and visibility, including getting their names included in party literature. The party&apos;s backing has meant less in recent years, though, as patronage has dwindled. Challenger Donna More, a former prosecutor, called the endorsement process a political play because of Foxx&apos;s ties to prominent Democrats. More didn&apos;t expect an endorsement, with her campaign even printing news releases blasting the committee&apos;s decision to pick Foxx before it was publicly announced. "They want someone in that office they can control," More said. Foxx&apos;s former boss, Cook County Board President Toni Preckwinkle, took part in Thursday&apos;s vote along with Chicago aldermen and state lawmakers. Foxx, a former assistant Cook County state&apos;s attorney, and Preckwinkle dismissed More&apos;s claims. Preckwinkle has blasted Alvarez for being too focused on prosecution rather than alternatives when it comes to low-level drug arrests. Foxx said the office needed an overhaul and that the county&apos;s justice system has become a national embarrassment, especially on the issues of allegations of police torture of suspects. "This is a transformative moment for Cook County," she said.